Rabbi of the second half of the seventeenth century; probably born in Wilna, from which city his father, Ephraim b. Jacob ha-Kohen, fled to Buda (Ofen, incorporated into the present Budapest) during the Cossack uprising of 1655; died in Palestine after 1686. Löb remained in Buda until 1684, when he went to Jerusalem, and there, with the assistance of Moses Galanti the younger, began to prepare for publication his father's work "Sha'ar Efrayim." When Charles of Lorraine wrested Buda from the Turks in 1686, the members of Löb's family lost all their possessions and removed to Prague. Löb returned from Palestine to that city; and wealthy people there assisted him to publish the "Sha'ar Efrayim," with his own notes and an appendix (Sulzbach, 1686). He went again to the Holy Land, and died in Safed (according to others, in Jerusalem). 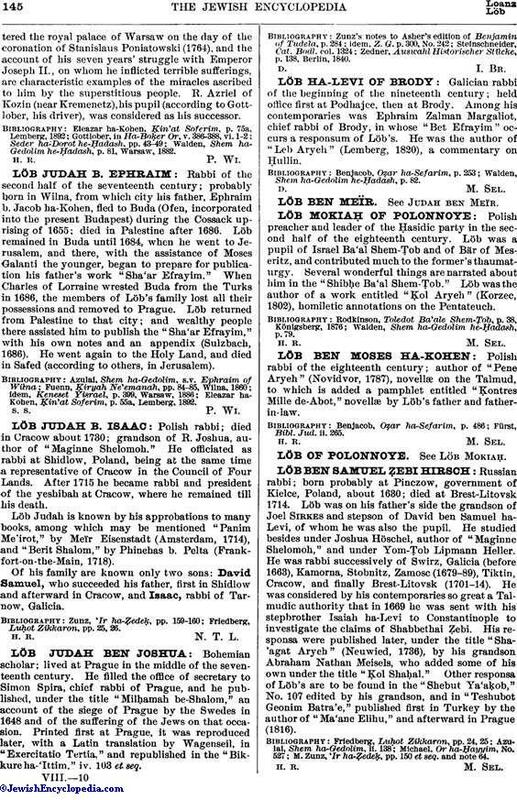 Eleazar ha-Kohen, Ḳin'at Soferim, p. 55a, Lemberg, 1892.